It seems that Current360 isn’t the only ad agency whose creative director has an inexplicable affection for NBA legend Dikembe Mutumbo. 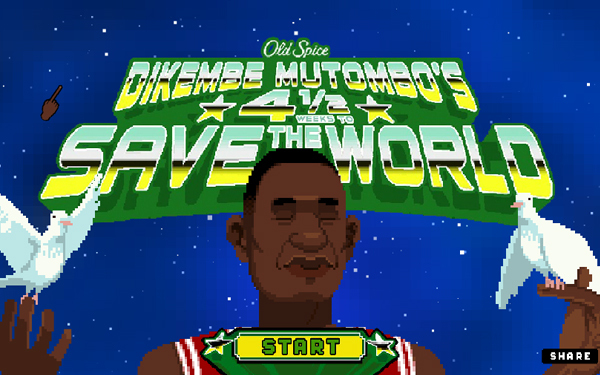 The latest Old Spice push from Portland’s Wieden+Kennedy is an online video game called Dikembe Mutombo’s 4½ Weeks to Save the World. Since they are constantly doing bizarre and memorable projects together, Old Spice and W+K have pretty much rendered it pointless to single out any one of their campaigns as more brilliant than any other. But the wagging finger cursor? The nostalgic 8-bit graphics? Dikembe’s hilariously unaware voice over!?! I mean, this whole thing is comedy gold; I just had to talk about it. Basically, this is an awesome campaign and I just wanted to show it to you. Have fun saving Earth!